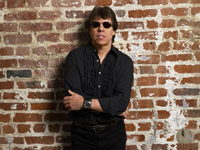 A blues-rock guitarist who draws his inspiration from Elmore James, Hound Dog Taylor, and Chuck Berry, George Thorogood never earned much respect from blues purists, but he became a popular favorite in the early ’80s through repeated exposure on FM radio and the arena rock circuit. Thorogood’s music was always loud, simple, and direct — his riffs and licks were taken straight out of ’50s Chicago blues and rock & roll — but his formulaic approach helped him gain a rather large audience in the ’80s, when his albums regularly went gold. Originally, Thorogood was a minor-league baseball player but decided to become a musician in 1970 after seeing John Paul Hammond in concert. Three years later, he assembled the Destroyers in his home state of Delaware; in addition to Thorogood, the band featured bassist Michael Lenn, second guitarist Ron Smith, and drummer Jeff Simon. Shortly after the group was formed, he moved them to Boston, where they became regulars on the blues club circuit. In 1974, they cut a batch of demos which were later released in 1979 as the Better Than the Rest album. Within a year of recording the demos, the Destroyers were discovered by John Forward, who helped them secure a contract with Rounder Records. Before they made their first album, Lenn was replaced by Billy Blough. Thorogood & the Destroyers’ eponymous debut was released in early 1977. The group’s second album, Move It On Over, was released in 1978. The title track, a cover of Hank Williams’ classic, was pulled as a single and it received heavy FM airplay, helping the album enter the American Top 40 and go gold. Its success led to MCA’s release of Better Than the Rest, which the band disdained. In 1980, Ron Smith left the band and the group added a saxophonist, Hank Carter, and released their third album, More George Thorogood and the Destroyers. Following the release of More George Thorogood, the guitarist signed with EMI Records, releasing his major-label debut, Bad to the Bone, in 1982. The title track of the album became his first major crossover hit, thanks to MTV’s saturation airplay of the song’s video. The album went gold and spent nearly a full year on the charts. Thorogood’s next three albums after Bad to the Bone all went gold. Between Bad to the Bone and Thorogood’s next album, 1985′s Maverick, the Destroyers added a second guitarist, Steve Chrismar.